Status: This document is no longer maintained. It is left her for historical reasons. "The social value of the Web is that it enables human communication, commerce, and opportunities to share knowledge. One of W3C's primary goals is to make these benefits available to all people, whatever their hardware, software, network infrastructure, native language, culture, geographical location, or physical or mental ability." W3C is actively translating this goal into concrete actions. This document summarizes the real investments that W3C is making in initiatives that directly support the continued extension of Web technologies and their benefits to the whole world, and especially the developing world. In addition, this document outlines plans for a significant expansion of W3C's efforts over the next year. Growing International Presence. Founded in 1994 by Web inventor Tim Berners-Lee, W3C's organizational basis extends across continents and countries. The Consortium's primary operations are hosted by three prestigious, international institutions: the Massachusetts Institute of Technology (Boston, Massachusetts, USA), the European Research Consortium in Informatics and Mathematics (Sophia-Antipolis, France) and Keio University (Shonan Fujisawa, Japan). Additional W3C Offices have been established in 17 locations, including Australia, Benelux/Bénélux (Belgium, Netherlands, Luxembourg), 中国(China), Suomi (Finland), Deutschland und Österreich (Germany and Austria), Ελλάδα (Greece), 香港 (Hong Kong SAR, China)| Magyarország (Hungary), ישראל (Israel), भारत (India), Italia (Italy), 한국 (Korea), المغرب (Morocco), Southern Africa, España (Spain), Sverige (Sweden), and the United Kingdom and Ireland, with new Offices planned for the near future (see below). Each Office has the mission of promoting adoption of W3C standards among developers, application builders, and other standards setters; and of encouraging stakeholder organizations to participate in the development of future W3C standards. Open to the World. W3C is -- by nature and through its Process -- a multi-stakeholder organization that is open to entities from all over the world. Among the ranks of its close to 440 Members are commercial businesses (both technology vendors and consumers), academic and research institutions, government agencies, and non-profit organizations representing a broad range of interests. All Members have the same rights within the organization, including participation in Working Groups. Technically-qualified individuals from organizations that cannot afford to become Members may be able to participate in standards development work as Invited Experts. Accountable to the Global Public. W3C is also accountable to Members and to non-Members around the globe. For example, all Working Groups maintain public Web sites and mailing lists, and make draft standards documents available to the public at a very early stage. W3C must address comments and concerns submitted by the non-Member public on standards under development. Public Participation Fora. W3C maintains a number of public-participation Interest Groups, which provide the wider Web community (Members and non-Members) with mechanisms for discussing current and future Web standardization work, and for worldwide collaboration and community building via open email lists. Standards Enable New Opportunities. The Web has already proven to be an effective mechanism for expanding communication, understanding, innovation, commerce, competition, and productivity throughout much of the world. Open Web standards enable interoperability between data and applications across the Internet. W3C's Members have worked together to produce the standards that are the foundation of today's Web, including the HyperText Markup Language (HTML), Extensible Markup Language (XML) and other technologies. W3C is also laying the foundation for a much richer and far-reaching Web of the future, with work on new standards for graphics, for accessing the Web via a variety of devices and types of human interaction, and for supporting computer-to-computer interaction and understanding (such as Web Services, and the Semantic Web). Standards Enable a "Web for Everyone." W3C conducts substantive work in areas with the particular objective of enabling universal access to the Web. The Web Accessibility Initiative develops technology, guidelines, and tools to increase accessibility of the Web for people with disabilities. Internationalization Activity, develops standards and guidelines that make it easy to use W3C technology worldwide by breaking down barriers between the Web and our planet's many languages, scripts, and cultures. W3C's Mobile Web Initiative aims to make Web access from a mobile device as simple and convenient as Web access from a desktop device. This is critical for the developing world, because mobile devices are less expensive, are experiencing explosive growth, and already far outnumber desktop and notebook computers. Royalty-Free Patent Policy. The goal of W3C's industry-leading Patent Policy is to promote the creation of Web standards that can be implemented on a Royalty-Free basis, thus advancing the wide-spread use of these standards in commercial and non-commercial applications throughout the world. Translations. There is an growing effort to translate W3C standards and reports and press releases into multiple languages. This work is supported by a large and growing network of volunteers from around the world. To date, documents have been translated into subsets of over 40 languages. The international press coverage of W3C's work is extensive and expanding. Relationships with Other International Organizations. The Consortium maintain liaisons with over 40 national, international and regional organizations around the globe, including IETF, ISO, ITU, OMA, OASIS, GGF, Unicode, the United Nations and many others. The combination of these characteristics is unique among standards consortia, and places W3C is a strong position to increase participation from and benefits to an expanding segment of the world. In addition to the above described record of commitment and action in the area of global outreach and participation, W3C has more to do. 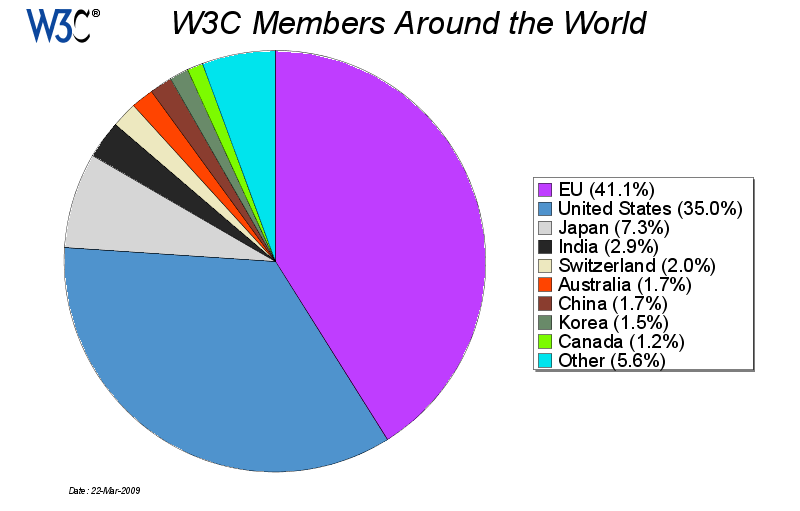 The majority of W3C's current Members are based in North America, Europe or Japan. Most of the Working and Interest Group participants and participants on W3C's Member and public mailing lists are from these same regions. However, a significant fraction of our Members are multinational organizations, and thus are often represented by individuals from outside of these three regions. Nevertheless, the regions of the world hosting the large majority of the world's population are underrepresented in W3C at this time. What are some of the barriers to building a more global level of participation? In attending international conferences, engineers and managers who are not familiar with W3C sometimes have the impression that the Consortium is a western commercial alliance. Conversations with people from developing countries indicated that W3C's Membership fees were a significant barrier to Membership, and are also sometimes taken as a sign that W3C is not interested in participation from organizations in these countries. Improved Mutual Understanding. Broader participation in W3C's work will foster an improved understanding W3C's unique position and characteristics as an open standards body, and provide the necessary input to allow the W3C's standards process to evolve in a manner that better satisfies the diverse and expanding needs of the world as a whole. More Widely Used Web Standards. Because they meet a broader range of global requirements and are better understood by global experts, W3C technologies will become more widely implemented around the world. Greater Opportunity for Everyone. The above three benefits will provide increased opportunities for improving communication, understanding, innovation, commerce, competition, and productivity throughout the world. People around the globe will be able to share and find data, information and knowledge more easily, using languages and technologies accessible to them. Organizations (including W3C Members and non-Members, commercial and non-commercial entities) will develop more Web-based products and participate in new and expanding local, regional and global markets. Developing countries stand to benefit substantially: Their emerging information and communication infrastructures, less burdened by legacy systems, can more easily adopt to and benefit from new Web technologies. Growing use of the Web will foster exchange of information that will lead to improvements in agriculture, engineering, education, health care, and nutrition, while providing an avenue for expanded commercial and social networking with other countries. Open New Offices. W3C now has Offices in the developing regions of northern Africa (Morocco), southern Africa, south Asia (India) and China. We are actively exploring candidate institutions to host new Offices in Latin America and Africa in the near future, and additional Offices later. Establish New Liaisons. We are developing relationships with additional international organizations, governmental agencies, non-governmental organizations, national and international standards bodies, and overseas offices of current Members in order to identify and reach out to those from underrepresented countries who might be interested in participating in W3C's work and/or would benefit from our work. Reduce Financial Barriers to Membership. In April 2005, W3C announced a unique program to substantially reduce Membership fees by 40 to 85% for small companies and not-for-profit organizations based in the developing world. Reduce Financial Barriers to Participation. We will explore sources of funding (e.g., from governments or foundations) that could support participation of qualified experts from developing countries in the development of standards at W3C (e.g., to help pay for participation in Working Group teleconferences, travel to selected meetings, etc.). Reduce Non-Financial Barriers. There are other barriers to active participation in any international effort, including language, jargon, time zones, time commitments, etc. Perhaps there are creative ideas that could mitigate the effects of these sometimes difficult obstacles. Extend Outreach. We are working with the Members, Offices and liaisons to develop Web and hardcopy materials to that tell the world what W3C is, what W3C does, how one becomes involved, and how one might leverage W3C's work to improve life. The W3C Team, Advisory Board, Advisory Committee, Offices, and interested parties from countries around the world will continue to discuss, expand and implement the above plan. Created by Steve Bratt in 2005.